I'm going to warn you, this grain-free granola is crazy addictive! It's chunky & crunchy, full of superfoods, healthy fats, fibers & protein! I'm not kidding, I make a batch and it's doesn't even last a week in my house. No, not because my husband and I are both eating it... it's just me! It's a great smoothie topper, additive to yogurt, sub for cereal or perfect for a quick simple snack. I've been making different versions of this recipe for a few years now but this one happens to be my favorite! I typically go to the bulk section of my local healthfoods market or Whole Foods & fill a few bags with a scoop of each of my favorite nuts and seeds. In this recipe I went a little bonkers and happened to use Cashews, Almonds, Pecans, Walnuts, Pumpkin Seeds, Sunflower Seeds, Hemp Seeds, & Chia Seeds. But you can use whatever nuts and seeds float your boat! Just make sure you're using the same ratios that the recipe calls for! The Chia Seeds & Hemp Seeds give this granola an additional Superfood nutritional punch. What makes these tiny little things so beneficial to you? Fiber - Chia Seeds are extremely high in fiber. Consuming just 2 Tbsp a day will provide you with 41% of your daily needed Fiber intake. Calcium - Chia seeds contain 5X more Calcium than milk! Potassium - Instead of reaching for a Banana, add 2 Tbsp of Chia Seeds to your breakfast. Chia Seeds contain 64% MORE Potassium than a Banana. Omega-3 - Chia Seeds have contain 100% MORE Omega-3 Fatty Acids than Salmon! Antioxidants - 2 Tbsp of Chia Seeds contain 2X more Antioxidants than Blueberries! Which happens to make them one of the richest sources of Antioxidants! Magnesium - 2 Tbsp of Chia Seeds will provide you with 32% of your daily needed Magnesium intake! Protein - Just 2 Tbsp contain 20% protein! Protein - Hemp Seeds are a Complete Protein. Meaning they contain all 20 amino acids but also the 9 essential amino aids are bodies are unable to produce on their own! Fiber - High in insoluble and soluble fiber, making it a natural colon cleaner and will help reduce sugar cravings! Vitamins & Minerals - Hemp Seeds are high in Vitamin A, C & E. As well as multiple minerals including Phosphorus, Potassium, Magnesium, Calcium, Sulfur, Iron, and Zinc. Omega-3 & Omega-6 - Hemp Seeds provide a 3:1 Omega-3 Omega-6 ratio which helps keep you heart healthy! Easily Digestible - Hemp Seeds are easier to digest than any other high-protein food. Including meat, whole eggs, cows milk & cheese. 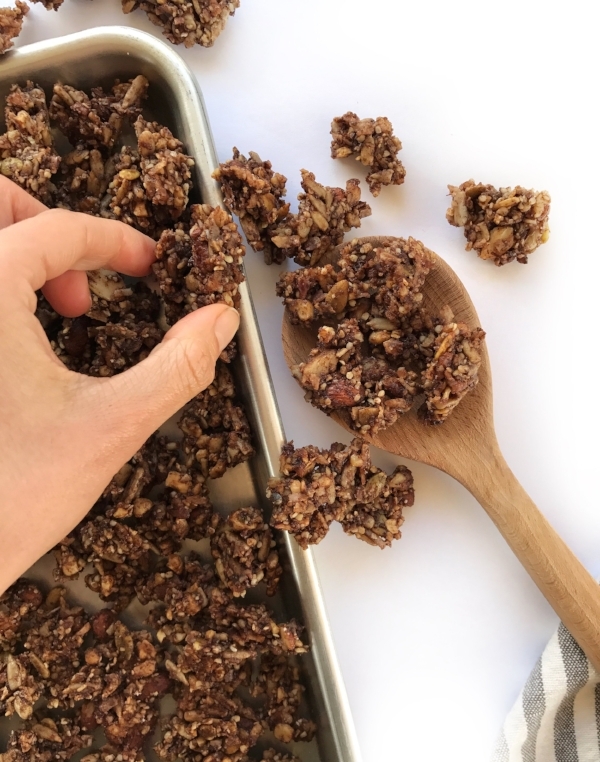 Paleo, gluten-free, dairy-free, refined sugar-free, & can be made vegan - This crunchy, chocolatey granola is far from the processed sugar-packed, nutrient-deficient junk you'll typically find on the shelves of your supermarket. LINE A BAKING SHEET WITH PARCHMENT PAPER AND PREHEAT OVEN TO 300 DEGREES. MIX TOGETHER WATER AND GROUND FLAX AND SET ASIDE UNTIL A GEL-LIKE CONSISTENCY IS ACHIEVED. IN A LARGE BOWL, WHISK YOUR MELTED COCONUT OIL, GROUND FLAX MIXTURE, MAPLE SYRUP, CINNAMON, RAW CACAO, & SALT TOGETHER. ADD YOUR CHOPPED NUTS/SEEDS TO THE WET MIXTURE. SPRINKLE WITH 1 SCOOP GELATIN & GIVE YOUR GRANOLA A REALLY GOOD STIR TO COMBINE. SPREAD YOUR MIXTURE OUT ON YOUR LINED BAKING SHEET AND POP IN PREHEATED OVEN. BAKE IN THE OVEN FOR 45 MINUTES TOTAL. TAKE OUT OF THE OVEN AFTER THE FIRST 20 MINUTES IS UP & STIR. PUT BACK IN THE OVEN FOR REMAINING 25 MINUTES. AFTER ENTIRE 45 MINUTES IS UP, REMOVE FROM OVEN AND DO NOT TOUCH! WHAT MAKES THIS GRANOLA SO CHUNKY IS LETTING IT COOL FOR A GOOD 15-20 MINUTES.